If you are a small contractor or consulting firm looking to strengthen and expand your business, you will want to attend the 2018 Small Business Development Program Kick-Off. Extended deadline! Apply to be part of the City of Atlanta’s Small Business Development Program by January 24. 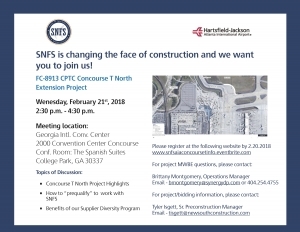 Join SNFS for a project information session on the Concourse T North Extension. Registration is now open for ATLNext Industry Day! Learn how to get SMART about doing business with Hartsfield-Jackson Atlanta International Airport at bimonthly workshops. Each session offers a different topic to help you navigate the process. Public invited to attend scoping session on Environmental Assessment. If you are a small contractor or consulting firm looking to strengthen and expand your business, you will want to attend the 2019 Small Business Development Program Kick-Off. Mark your calendars! 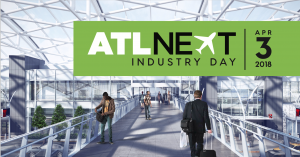 ATLNext Industry Day will be held Tuesday, March 5, 2019, to provide details on the multibillion-dollar capital improvement program at Hartsfield-Jackson. Registration will be available soon.